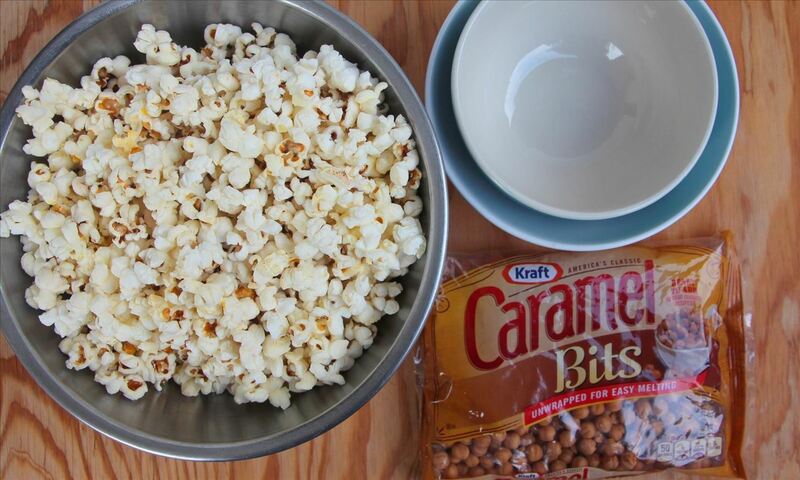 This easy "recipe" requires just two ingredients: popcorn and caramel bits. Caramel bits are made for melting, and they take all the work out of making caramel-based anything. If you've ever made caramel before, the result is delicious, but it's often hot and sticky work—in most cases. I don't like microwave popcorn, so I always use an air popper or pop popcorn in some olive oil on the stove, but you can use the version you like best. If you're okay with the it, microwave popcorn will work fine here, though. Since the caramel has so much flavor, I'd suggest using the simple salted microwave popcorn bags instead of the buttery popcorn flavor. 2 bowls (other than your mixing bowl) of different sizes. One should be small enough to fit inside the other. 2–4 cups popcorn (depending on size of your popcorn bowl). ½–2 cups melted caramel (depending on size of your popcorn bowl). Lightly coat the inside of a bowl with cooking spray. This will be your popcorn bowl "mold," so choose a bowl that is roughly the size of the bowl you want to make. Lightly coat the bottom of the second, smaller bowl that fits neatly into the larger bowl. You will use this to press the popcorn down into a nice, smooth shape. Melt the caramel bits in the microwave according to package directions. Stir to make it smooth. 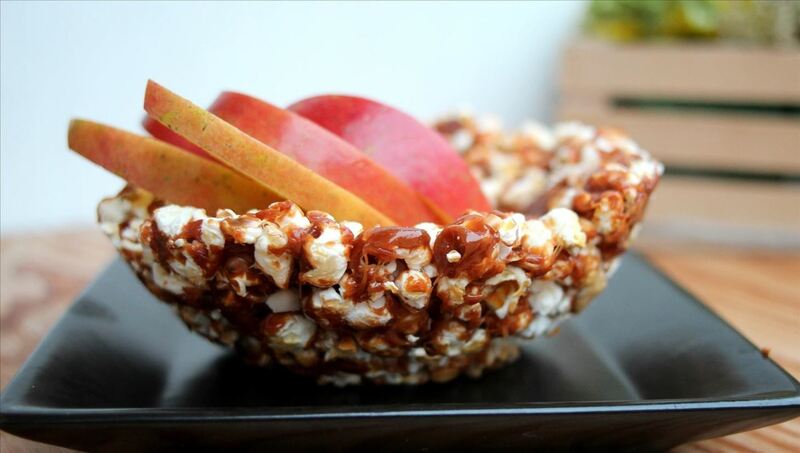 In your mixing bowl, pour the melted caramel over your popcorn and quickly toss everything to coat the popcorn. You can use wooden spoons here, as the caramel is hot. When the popcorn is mostly coated with caramel, put it into the larger of the two bowls, pressing down on the sides so that it mostly forms a bowl shape. Using the small bowl, press down so that your popcorn bowl becomes smooth. 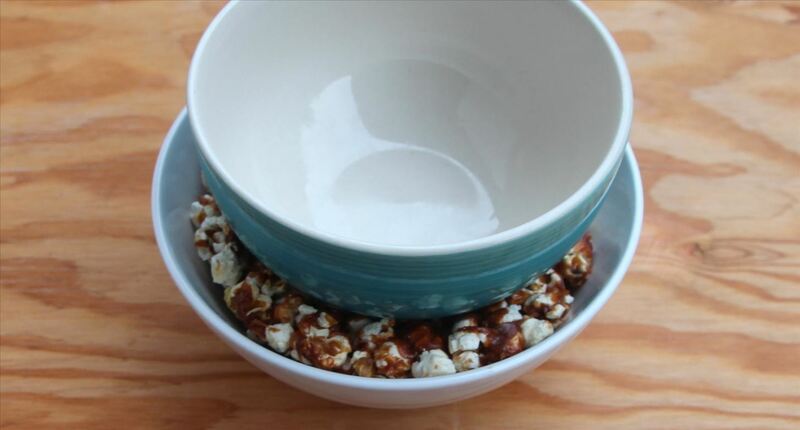 Remove the popcorn bowl and fill with apples, other fruit, plain popcorn, chips, or any other snacks of your choice. Like to Have Your Cake & Eat the Plate, Too? We have more edible bowl ideas, including bowls made out of Parmesan cheese (for salads), cookie dough (for shots), and chocolate (for fun).